Monday 16 June was another hands-on session – this time learning Sugar Craft with Andrew Bradfield. Everyone enjoyed making their own sugar fondant rose and it has inspired some of us to go away and develop our skills. Thank you Andrew! Monday 19 May was a hands-on hand massage session with Maggie Croft. We learnt lots of useful tips on hand massage and everyone went home very relaxed. Thanks Maggie! 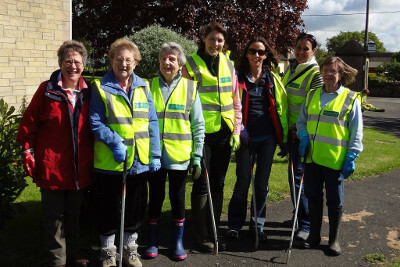 On Monday 12 May, All Angels WI and KSM WI did a fantastic job picking up litter around the village. Well done ladies! The Knitting Circle meets on alternate Wednesday evenings and Thursday mornings (starting from Wednesday 26 March at 8pm in The Jolly/Thursday 3 April from 10 – 12pm in KSM Club). Everyone welcome from beginners to experts! There was a fantastic turn out for the All Angels’ quiz night and everyone’s grey matter was well and truly warmed up! 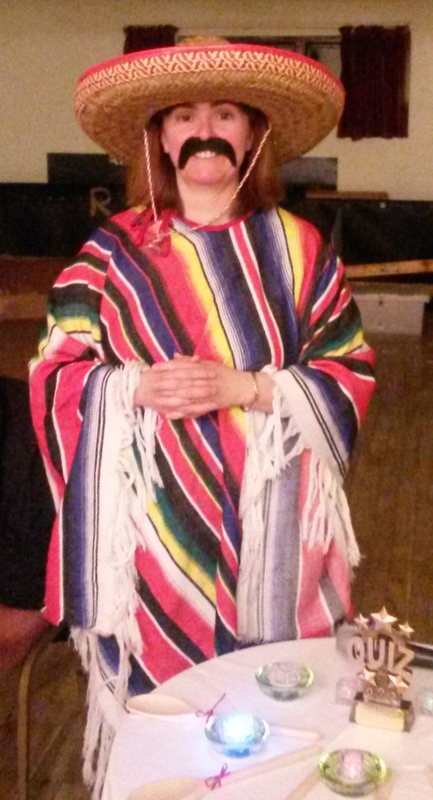 To everyone’s bemusement and amusement there was a Mexican quiz master with an excellent command of English. The final scores were high, but it was team “Bakers’ Half Dozen’ who claimed the trophy leaving team “Autumn Club” with the wooden spoons. Thank you to everyone who came along and made the night such a success – we raised £133.28! Well done and a big thank you to Debra and her team. Please note that there have been changes to the original events’ calendar, notably for the events in May, June and July so please use the events’ page to update your diaries. We hope all the events will proceed as planned, but the programme is always subject to change especially as many of the events rely on people giving their time as a volunteer. Pampered Chef consultant, Claire Pugh, gave a short presentation before it was all hands on deck to create two delicious savoury rings. 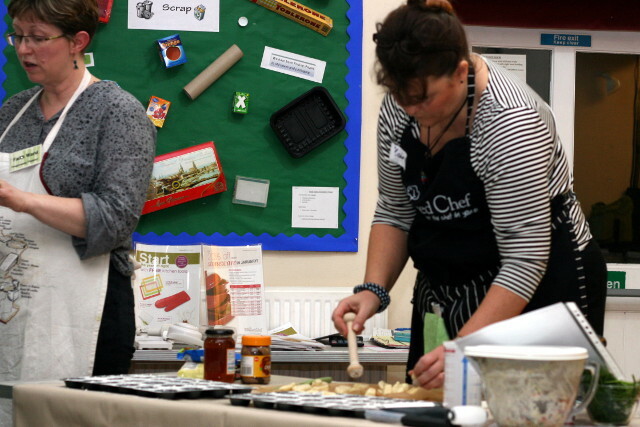 Everyone enjoyed trying out the products or watching and we especially enjoyed tasting the end products. However, the tasting did not end there as many members had brought in their favourite family recipe for other members to try. 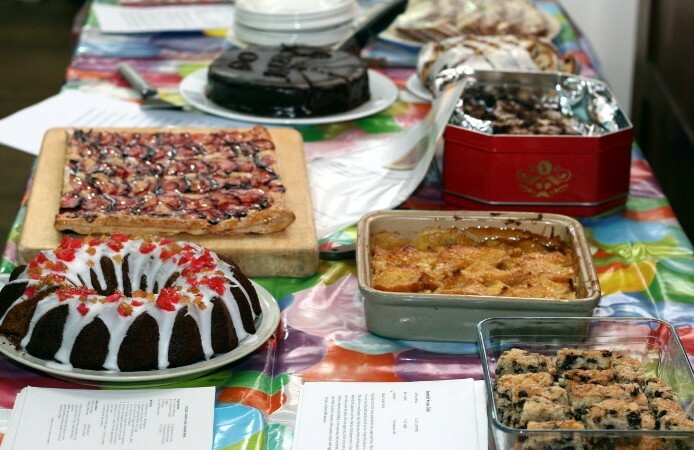 A huge table was covered with cakes, biscuits and savouries and everything looked and tasted delicious. All recipes will soon be added to the website so keep a look out for your favourites. The committee have well and truly excelled themselves by filling the 2014 calendar with an eclectic mix of meetings ranging from wine tasting and chocolate making to dancing, photography, reiki, first aid and IT safety. Take a look at the events page for all the latest information. We hope all events will proceed as planned, but the programme is subject to change. Happy New Year from All Angels WI! We hope you all had a wonderful Christmas and New Year. We are looking forward to getting back into the swing of things starting with our exciting baking session on 20 January. Hope to see you there!